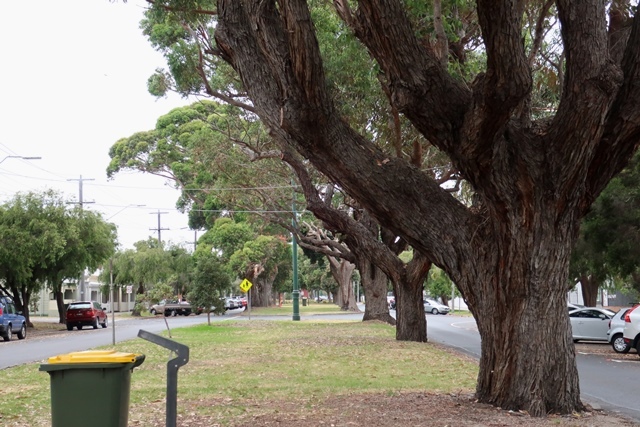 Each year begins with the profuse flowering of Corymbia ficifolia trees in the broad Danks St median that connects Middle Park and Port Melbourne. 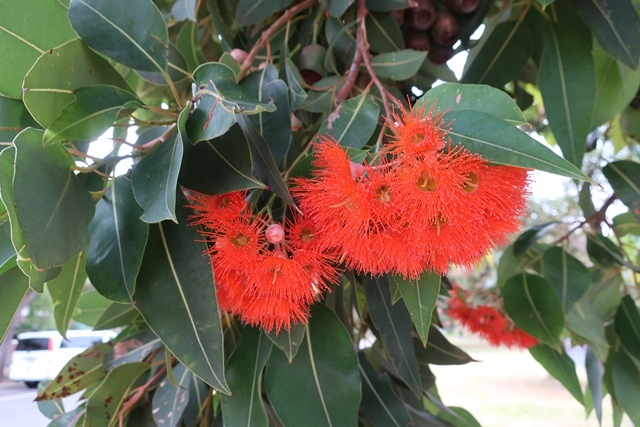 The flowering gum is originally a native of open forest in a very restricted area on the far south coast of Western Australia. The trees intensely coloured and abundant flowers make it popular in cultivation and it is now found all over Australia. I’m ambivalent about flowering gums. Too brash and gaudy on the one hand, and on the other, such welcome colour when everything is drab and dry. And who can resist their magnetic attraction to screeching, feasting rainbow lorikeets? In the most recent Aussie Backyard Bird Count (October 2018), the rainbow lorikeet was the most counted bird – 305,00 Australia wide. In Victoria, the magpie topped the list with 36,983 counted but the rainblow lorikeet was very close behind with 35,482 birds. The widespread introduction of native trees in cities since the 1970s has favoured nectarivores like the rainbow lorikeet. With nectar available all year round, lorikeets have hung around and multiplied, displacing other birds in the process. Also in the median are some less showy, but more mighty specimens of Eucalyptus botryoides (Southern Mahogany). Hardly an avenue, just a short sequence. These huge trees are just part of the scene, barely noticed. But when one of their number died last year, it highlighted the vulnerability of these taken for granted trees. Many parrots absolutely depend on tree hollows for breeding but few of Port’s trees are old enough to support them. That dead tree now hosts a chainsaw hollow. 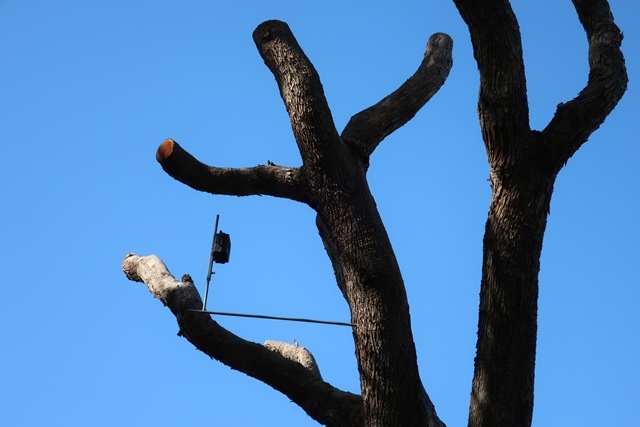 Parrots appear more willing to nest in these hollows made with chainsaws than in nest boxes. Nest boxes can get too hot if the orientation of the tree has not been sufficiently taken into account, or if they are not appropriately insulated. Like other dwellings, they also need to be maintained. With the opportunity to create brand new parks almost impossible in dense inner urban areas, landscape planners are having to think differently about open space. Rather than relying only on separate and dedicated reserves and parks, planners are looking at making the most of the open space we do have, and how it can be connected and threaded together for the benefit of biodiversity and for people. Might the Danks St median become, not just a dusty and neglected space separating cars, but a continuous link with other nearby open spaces such as Gasworks Park and Lagoon Reserve? Howe Parade in Port Melbourne provides an example. And rather than walking along the hard hot footpath, wandering along a shady pathway in the median on the hot January days amongst the flowering gums and venerable eucalypts. There might even be a bench or two. Each of those mighty Southern Mahogany gums would be surrounded by mulch, signalling care, since protecting existing trees is the most important single action we can take for trees. Young trees, as we’ve seen over and over again in Port, are subject to vandalism, and succumb to the very heat they are trying to counter. And it will take a life time or more for them to attain the stature of those eucalypts in Danks St.
Janet the Rainbow Lorikeets ate many armonds off our tree last year. They got to them while the outer shell was soft which I guess fits in with them eating soft fruits. This year the tree was visited by Little Corellas which are actually quite big. Some netting stopped them decimating the crop. They arrived one afternoon, feasted until shooed away then came back first thing the next day and looked quizzically at the netting. Interesting Nick, we haven’t had Little Corellas our way. Thinking back, I reckon we had many more wattle birds twenty years ago than we do now.